This post is my contribution to #LetsLunch, a virtual monthly potluck on Twitter. This month’s theme is all about pickles. Aside from my Quick Asian Pickles, which I posted recently, I am not much of a pickler. But I love to eat anything pickled. Pickles, and fermented foods in general, are all the rage these days. Dating back millennia, fermentation was one of the original methods to preserve food. These days, from kimchi to yogurt, it’s all about the probiotics. Probiotics, or good bacteria, are increasingly being seen as beneficial not only for digestive health but possibly also for allergies and even weight loss. The most recent homemade pickles I’ve enjoyed were at a recent dinner by the supper club I’ve belonged to for the past year. Unlike other supper clubs, which are usually pop-up restaurants hosting meals for strangers, ours is a private affair. A year ago, a couple of friends proposed the idea of having a supper club. The idea for our supper club came about from a member who has vivid memories of his parents’ supper club in the ’70s, enigmatic adult-only dinner parties that would last into the wee hours of the morning. We’re reviving the model and plan quarterly themed dinner parties. We’re a group of four couples in San Francisco who share a love of food, travel, adventure and conversation. To be clear, we really, really love food. Several of us have been known to fly across the oceans in pursuit of one particular meal. As might be expected from people who travel to eat, we can be a bit fanatical in our menu planning. While all of us were friends with the organizing hosts, several of us were strangers to each other when the supper club began. But after marathon dinners stretching for 6 hours or more, we’ve gotten to know each other quite well. A lot of things come up around food. One time, the host recalled a particularly embarrassing incident involving an ill-fitting sky blue suit jacket. (Sadly, this was before social media.) Another time, when we were going around sharing where we’d gone to college and what we’d studied, one of us couldn’t stop giggling at the revelation that another member had majored in European History. The rest of us are still not sure why that was so amusing. But, all is accepted without judgment in our supper club family. With all this bonding, these supper club dinners have produced some truly wonderful meals as well as nourished, or since we’re talking pickles, fermented some great friendships. What have we cooked? The first year’s supper clubs explored ethnic themes, either based upon the host’s heritage or a recent trip. We started with an Asian Mashup, which explored one of the host’s Indian heritage as well as other food from Asia. That was followed by Comida Porteño, based upon the host’s recent trip to Buenos Aires. We followed with a Trini Carnival themed menu that explored the Indian and Afro-Carbiiean foods of my husband’s home, Trinidad. And most recently, we explored the foods of Eastern Europe and the varied Eastern European backgrounds of our hosts. If you’re interested in the menus, recipes and stories, please visit our group blog, Spicebox Supperclub. Who knows where we’ll go next? Now, for the pickles. 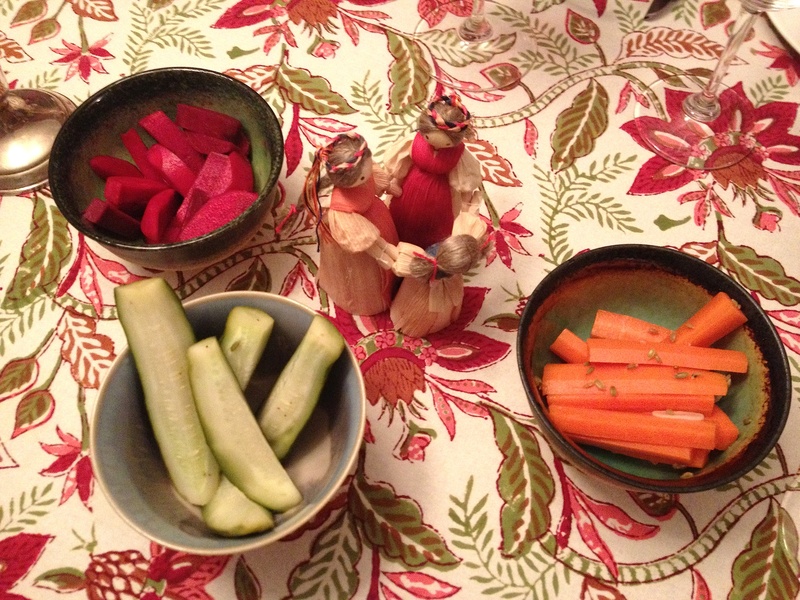 Our host, Dave, presented a trio of typical Eastern European pickles: cucumbers, carrots and turnips. These presented a bright and tart contrast to the rich Eastern European fare. 1. Place the sliced garlic in a small saucepan of water and bring to a boil. Boil the garlic for 1 minute, then drain immediately. This blanching process will keep the garlic from turning blue in the pickle jar. 2. Place the blanched garlic, fresh dill, bay leaves and other spices into the pickling jar or jars. If using two jars, divide the ingredients evenly between them, half in each. The red pepper flakes are optional, and will add a little kick to your pickles—if you don’t like spice, feel free to omit. 3. Slice off the tip ends of each cucumber, then place them into the jars, half in each jar. It’s okay if they’re tightly packed, they will shrink up a bit as they pickle. 4. In a saucepan, bring the water, white vinegar, and kosher salt to a boil, whisking till the salt is fully dissolved. Boil the mixture for about 1 minute, then remove from heat. Pour the hot brine through a funnel into each jar, submerging the cucumbers completely in liquid. 5. Let the jars cool completely to room temperature (this will take a few hours). Secure the lids and place pickles in the refrigerator. Your first pickle will be ready to eat in 48 hours; they’ll become more pickled and flavorful as they age. Pickles will keep for up to 2 months. Carrot sticks should be made at least one day in advance, and will keep for up to four weeks in the refrigerator. 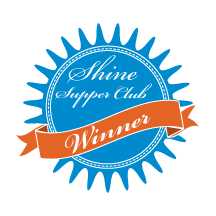 Have any of you participated in a supper club before? If so, please share your stories! Pingback: Spicy Pickles & Pork Sammy | sandwich surprise! It is really fun. We rotate roles (cocktails, sommelier, chef, pastry chef) so it is not too much work for any one couple and everyone gets to participate at each supper club. None of us are “chefs” but all love food and conversation. You do have to choose your members carefully though, to make sure they really want to do it! Sound delicious, I love pickles/fermented vegetables. They are a wonderful with a meal.